1. Zoroastrianism was a reformation of prehistoric religions from Indo-Iranian traditions dating back to 2,000 BCE. 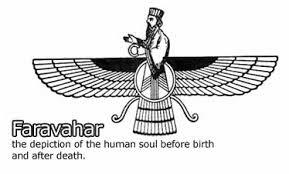 It was Zoroaster who exalted Ahura Mazda and formalized the religion to a mono-theistic tradition. Death is unknown, says he died at an altar by Turan (Turks) holy war. 2. During the Achaemenid Dynasty (648-330 BCE) King of Kings Cyress (600-530 BCE) created the first human rights which on his cylinder. These were the abolishment of slavery and religious freedom. The beginnings of Zoroastrianism are seen trough the Magi, Zurvanists. 3. After Darius I and other Achaemenid Emperors acknowledge their devotion to Ahura Mazda, the Persian Empire was still allowed religious freedom. At this period of time the Avesta, Zoroastrian sacred texts, and rituals began to flourish. The loss of Sacred Texts in this destruction is considered fictious. 600 CE Arabic and Islamic overthrow. This entry was posted in Zoroastrianism and tagged Adam B Daniels, Adam Daniels, Alexander the Great, Arlington, Cyress, Darius I, Darius III, Dastur Adam Daniels, Gathas, Lecture, Persia Empire, Shahnameh, Texas, Xerxes, Zoroastrianism, Zurvanism. Bookmark the permalink.